Lester Holt has called on several NBC News colleagues for advice as he prepares for the biggest night of his career. Holt's debate prep team has plotted possible questions for Hillary Clinton and Donald Trump and responses if the candidates stray from the truth. But once the debate begins on Monday night, Holt will be on his own -- which is a big difference between primary debates and general election debates. Holt has been mum about his debate prep, giving no interviews, even to NBC's own newscasts. He has sought to tune out all of the chatter and speculation, according to people close to him. This includes Trump's false claim that Holt is a Democrat and the Clinton campaign's call for vigorous fact-checking during the debate. But he has thought a lot about his responsibility to the viewing public. 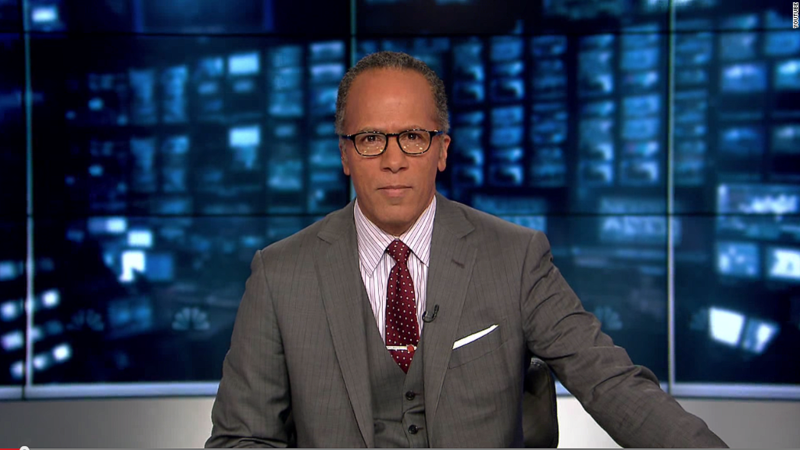 With regards to fact-checking, "Lester is not going to be a potted plant," one NBC staffer close to Holt said. Another staffer seconded that sentiment. This doesn't mean Holt will interrupt every time he hears a lie. Officials at the Commission on Presidential Debates say the candidates should challenge each other. But Holt will strive to avoid a repeat of NBC's "Commander in Chief Forum" earlier this month, when Trump falsely said he opposed the invasion of Iraq and interviewer Matt Lauer let it slide. Lack of preparation was cited by observers as one possible reason for the widely-criticized performance. The debate is different. Holt has had several weeks to prepare. And he has been in full-time study mode for several days. His last day on the "NBC Nightly News" was Tuesday; Savannah Guthrie has been filling in for him since. Guthrie will also anchor on Monday night. According to the commission rules, Holt alone is responsible for the questions he asks. The commission gives no editorial direction. Holt is free to seek ideas and advice from anyone he wants. In recent days, his counselors have included NBC News and MSNBC chairman Andy Lack; NBC News president Deborah Turness; and the news division's senior vice president of editorial, Janelle Rodriguez. Another key member of Holt's debate team is Sam Singal, the executive producer of Holt's "Nightly News." "Meet the Press" moderator Chuck Todd, senior political editor Mark Murray and political editor Carrie Dann have all helped as well. But this is not an NBC debate -- it is all being organized by the commission. When it comes time for the debate, only one NBC staffer will be with him. During primary debates (including the Democratic debate Holt moderated in January) TV producers can speak with the moderator through earpieces, proposing followup questions and supporting the host. Some production teams are more hands-on than others. But it works differently at general election debates organized by the commission. The only person in Holt's ear will be the commission's longtime executive producer, Marty Slutsky, who has produced all of the debates since 2000. Slutsky keeps track of time and lets moderators know when they have to wrap up the debate. Holt has ample experience in high-pressure live TV situations, which is one of the reasons why the commission chose him to moderate the Clinton-Trump matchup. "If there's anybody who can withstand the pressure and be down the middle and cool and calm and take this thing on, it is Lester Holt," his colleague Al Roker said on the "Today" show on Friday. "If all else fails, Lester could break out his bass," Tamron Hall joked. Holt is a newsman by day, bandmate by night. Last Tuesday, he played his bass at a party for the 25th anniversary of NBC's "Dateline" newsmagazine. It was a rare chance to unwind in between debate prep sessions. When asked about Monday night, he demurred, signaling that he wants his moderating work to speak for itself.